With spring finally on the horizon, families across the country are gearing up for warm weather and fun vacations. Whether the most anticipated part about the season is seeing the flowers bloom, pulling out your flip-flops, or packing up the car for a cross-country drive, spring manages to put the majority of people in a good mood. And, for Curious George fans out there, there is one more reason to be excited about spring... the fact that Curious George Swings into Spring is available tomorrow, March 12, 2013, on DVD and Digital Download! What better way to bring some extra joy and laughter to the month than to spend it with everyone's favorite mischievous monkey? 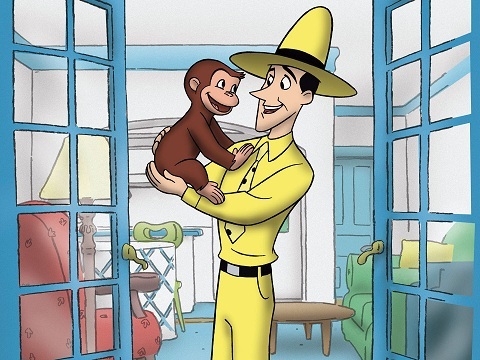 Based on the best-selling Curious George books by Margret and H.A. Rey, Curious George's television series and movies expand George's world to include a host of colorful characters and original locales. At the same time, the shows work to maintain the charm of the beloved books while also inspiring kids to explore science, math, and engineering in the world around them in a fun and entertaining way. By encouraging inquiry and curiosity, promoting hands-on exploration, and showing parents and caregivers how to support children's science and math-related play, it's hard to not be smitten with Curious George. Even as he gets into one scrape after another, he is still promoting important lessons... while capturing your heart with his inquisitive curiosity. Now that spring has sprung, the world's favorite monkey returns — as curious as ever — in his high-flying, full-length feature, Curious George Swings into Spring. In this cute tale, George is excited about the arrival of spring and wants his best friend, Hundley, to feel the same. The two explore all the wonders of the season together, including blooming flowers, baby animals and canoe rides, but nothing works to make Hundley love spring. Things go from bad to worse when Hundley gets lost in the country, causing George to take to the skies (accidentally) in a hot air balloon to sail over the countryside to look for him. Luckily, George and Hundley return safely and are rescued from the balloon by The Man with the Yellow Hat, the Doorman and Lydia. However, not only are George and Hundley saved, but they manage to win the coveted Spring Building Prize... which, finally, results in Hundley sharing in George's Spring Fever! Throughout the 57-minute running time of this new movie, Curious George yet again uses his insatiable curiosity as a way of acquainting viewers with key concepts in math, science, and engineering. As with his previous episodes and feature films, George's memorable (mis)adventures offer a perfect vehicle for motivating kids to expand their own investigations of the world. 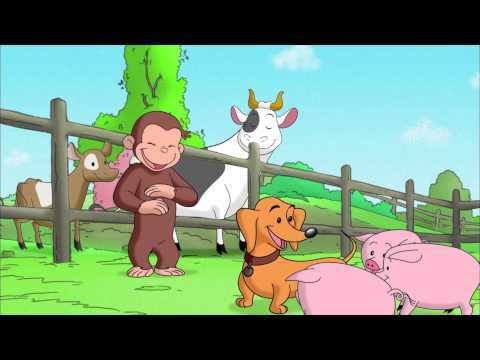 I love the way that Curious George is completely appropriate for children, always has a positive moral and has the real-life educational aspects that kids can apply and think about each time they watch. 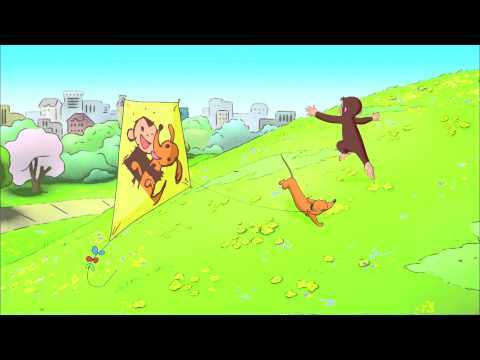 My kids have always been big fans of Curious George and being able to celebrate spring with him is no exception! 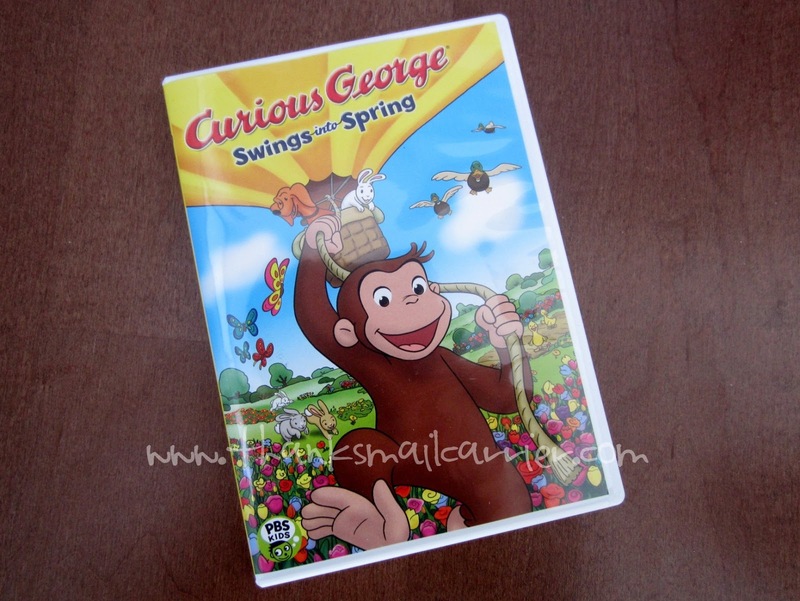 Available tomorrow with a retail price of $14.99, Curious George Swings into Spring is sure to be a hit for young fans (and us grown-ups, too) everywhere. 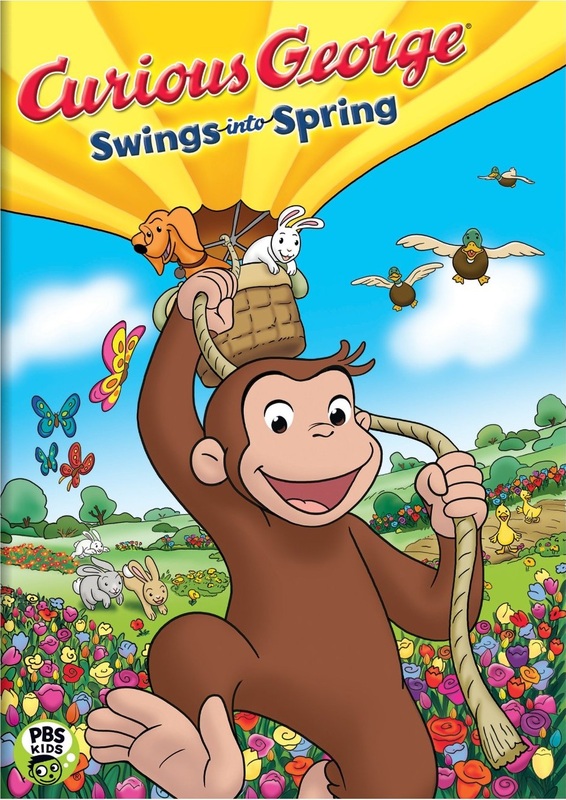 Curious George Swings into Spring on DVD! A big thank you to Universal Studios for providing a Curious George DVD for me as well as for one lucky giveaway winner. The opinions shared are my own and honest and if you really need to see more, click here to see how I roll. my little guy loves to swim! My daughter is looking forward to Easter. Playing outside on the play set and blowing bubbles! She likes the baby animals, bunnies etc. Looking forward to Easter and visiting with family! It means our Disney trip is closer than ever! For her it's Easter eggs, for me it's being able to go outside more often. My grandson is looking forward to playing baseball. Right now they are practicing inside. being able to get out of house without the hassle of coat and garb. My kids love when all the bunnies come out! this year, it's our first vacation in 7 years. My favorite thing about spring is the cool weather! My daughter and I are looking forward to more play dates at the park. I like when grass turns greener, warmer, longer days, and blooming flowers/plants. Playing outside, going to the park and zoo. I love the sun and blue skies. We love planting seeds in the garden and watching them grow. Learning how to ride her trike at grandma's house. My kid's are looking forward to Easter and their birthdays. We're both ready for warmer weather so we can spend more time outside! My kids love going outside to ride their bikes, rolling staking, drawing with chalk on the sidewalk and blowing bubbles. I love when the flowers start coming out! I'm looking forward to not having to bundle up before leaving the house! My kids love to play ball in the spring! My daughter loves to play outside, and here in Louisiana we may or not have a winter (depending on the year) but spring is the only time that is pleasant to play outside. Summer is dangerously hot and she doesn't get to play outdoors all that much. We have a new park close to our home so hopefully we will get to go play there before summer hits. My nephew is so excited Tee ball is starting. he is looking forward to playing soccer. My kids love the city Easter Eggstravaganza. We go every year. I'm very excited to take my daughter on an Easter egg hunt. Last year she was only 5 months old, but now she is walking so I know she will really enjoy it. Going to St. George Island, FL about 1 1/2 hours away, BEACH!! being able to run around in the yard with his soccer ball! Love going to the park. Planting flowers and fishing, they can't wait to get to the beach. Playing outside in the fresh air! My boys & I are looking forward to playing outside! My granddaughter loves to smell all of the pretty flowers!! I look forward to the flowers. They are already starting to bloom! Playing outside in the warm sunshine, after all that rain! I want the snow off the ground! visiting the many playgrounds at the nearby park! My kids love digging around in the flower beds and planting new seeds. My girl can't wait to play outside. My kids can't wait to swim and run in the sprinklers and plant some seeds! definitely being able to spend more time outside! My boys love being outside as soon as it gets warm enough to play without coats. My daughter loves the garden (can I confess to being so much less excited for the arrival of spring mud?). They love they'll be out of school soon! The warmer weather for more outdoor fun. My son loves getting to be outside more especially now that he has learned to tricycle. My grandson loves to play outside and the weather is getting so nice. My kid is looking forward to becoming a big brother this Spring! It will be my baby's first spring, and that is exciting enough on it's own! They are looking forward to spending more time outdoors! I love sitting outside with my dogs! We love to go bike riding! playing outside for longer without getting cold! more time playing on the playground! Warmer weather to go swimming. My most-anticipated aspect of spring is the warmer temperatures. Celebs Celebrate Easter at The Children's Place!